I would appreciate what dry dog food is the best to feed my three German Shepherd Dogs. Totally confused. One says this one and then another. Boy, talk about a potentially controversial question. Well I can tell you from experience that if you were to ask 10 different people the same question you'd probably get at least 7 different answers. Many people are brand loyal. Then there are economic reasons because some brands are quite pricey. So, with that being said I can tell you that you want to choose the best dog food that you can afford - that your dog enjoys and does well on. It doesn't matter if you can afford the $50+ premium bags of dog food, or only the cheaper dog foods, if it makes your dog have diahrrea, your dog is allergic to it or if your dog simply won't eat it then it is not a good choice for your GSD. Big tip: if any of the first 3 ingredients are grains of some type, or something that you can't even say out loud without difficulty then keep looking - dogs are meat eaters not field grazers. By the same token, if you can only afford the cheaper grocery store brands then you do the best with what you can. That's just the way that it is but I would suggest some supplements if this were your only choice to help your dog get the most nutrition possible from it's food. But if you really want to feed your German Shepherd the best possible commercial dog food out there here are a few to brands to choose from that are truly some of the "best of the best" in the dog food world with direct links to many of them so that you can read even more and compare for yourself. 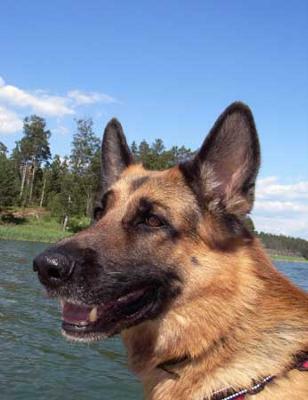 Read here to learn even more about Feeding German Shepherds. Good luck in your research and future decision! After attending a German Shepherd dog show we had a free consultation with a vet about the best food for a German Shepherd he said that they are meat eaters and said that in the bush if a dog returns to feed its pups it does not return with a bag of biscuits, we buy our shepherd chuck steak on the bone with lamb bones and when we have on occasions tried to give him a dog biscuit he spits it out of the side of his mouth, he is a magnificent specimen I would recommend that if you can afford it buy cheap steak its probably not much more expensive than so called good dog food. I have a purebreed high quality gsd pup of 3 months old now. I feed him pedigree international range and one boiled egg in the morning and then 1/2 kg yoghut mixed with water and then 5 small roti mixed with 250 gms bolied chicken one carrot and one tomoto. If it is fine with him. I also feed my 11 mth old male diamond lamb and rice. He had been on the cheap crap with my ignorance after changing his diet to something much healthier I swear he thanks me everyday. He gets two medium scoops of yogurt daily, GREEK yogurt. Of course his treats. While I am at work he goes to Doggie Daycare on a 3 acre farm so he isn't stuck in a house all day. He is 70 pds, fixed and this was the BEST PURCHASE I have ever made in my life. As a single mom he sure offers the intimidating look while rather being quite a ham and laid back! Occasionally we suffer from dry skin when brushed looks like dandruff. Still have not figured out what that is........ Any suggestions please email me @ lemastersusan@gmail.com. I feed my GSD Diamond Naturals Lamb and Rice formula. It is easy on their digestive system, makes coat healthy, high in omega 3 and is known to be one of the best formulas for allergies. I always wanted to feed Royal Canine German Shepherd but it is much more expensive. If you buy Diamond Naturals from a feed store, you can get it for approximately $40 for a 50lb bag.